In between snow and all sorts of other winter weather, the sun has broken out for sufficiently long spells in Canberra during the past week for me to complete the FuNkOMaTiC paint job. I like Dwayne's idea of an "Etsy-style description photo with it sitting out on a Starbucks' table next to an army surplus messenger bag and a Moleskin notebook. So fresh, funky and hipsterish!" I'll give some thought to that presentation next. 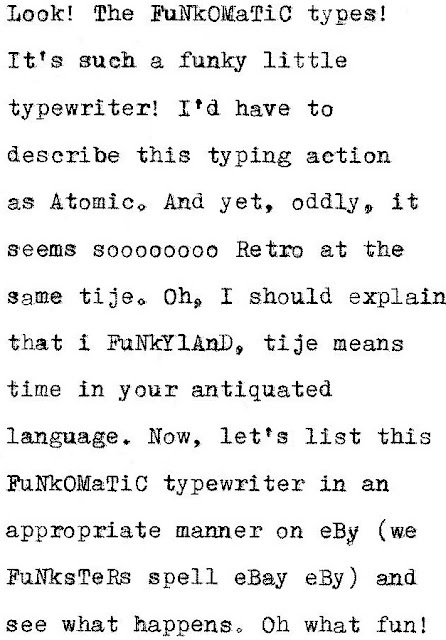 The funkiest, most atomic typewriter ever made! Well, Funky is Earthy, Original and Modish; Unconventional and Bizarre. It’s Outlandishly Vulgar and Eccentric, in a humorous or tongue-in-cheek way. And retro? Folks, this is retro with an “r”, an “e”, a “t”, another “r” and an “o”: Yes, that’s right: R – e – t – r – o! These FuNkY atomic colours are so strong they could withstand an A-Bomb blast! No other FuNkY, atomic typewriter has this combination of colours! I can guarantee it. And look at those FuNkY keys – ALL 49 OF THEM!!! The wonderful Swiss and Italian style “bucket” concave keytops are designed to fit your fingertips like a hand in a glove. This typewriter is designed for ULTRA-COMFORT typing! Now that's Atomic! And what about the FuNkY boots? 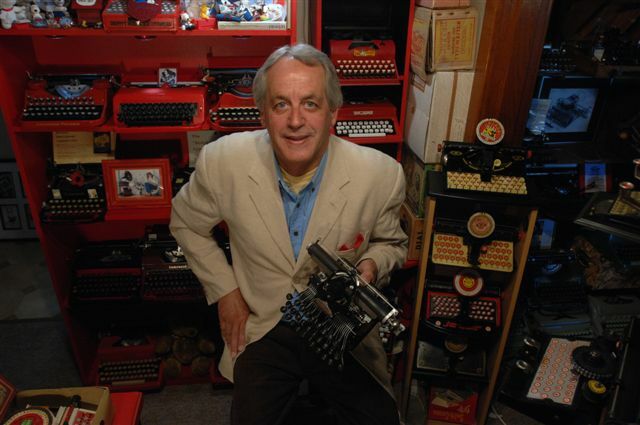 Look at those beautiful, neat-fitting little funkerish bootees underneath the typewriter! And the FuNkY case!!! A matching violet-coloured case!!! This FuNkY, atomic typewriter comes from a home with a cat in it. Live with it. We do. IT HAS A BRAND NEW RIBBON. You can't ask for better servicing than that! This is the sort of complete pre-sale service you get from only two or three other typewriter sellers in Australia. This FuNkY, atomic typewriter will be carefully wrapped in bubblewrap and packed in a box in such a way that only an A-bomb could damage it in transit. It will be couriered to and hand-delivered at the front doorstep of the auction winner at a cost of a mere $10, regardless of where you live in Australia. Note to Typospherians: This whole project is designed for amusement and to underline the ridiculousness of certain eBay typewriter sales in Australia. Nobody will be harmed, financially or in any other way, by the joke. The idea is not to play a prank at anyone's expense (except mine!). Once the eBay auction has run its course, the typewriter will be offered, as described, to the auction winner at a sensible, reasonable price. No profit-making will be involved. I love the way this project came out! The colors are so vibrant, and yet they really look great on the machine. And the description! I wish I could bid an offer for the machine, though that would mean sending it overseas to the other end of the Pacific... and no B-52s around to do the job! I can't wait to read about the reactions you get from the e-Bay regulars when you post this beauty there. Fantastic project. You could add that this rare typewriter is more than worth its weight in gold. Perhaps Chivas Regal instead of Starbucks. It's kind of horrible looking, good job! And because it was your intent for it to be an object of humor there is a beauty in it's ugliness. Honestly, I would bid on it if only because this machine has a story like no other. Oh, my goodness. The FuNkOMaTiC marketing is sublimely perfect. I wouldn't change a word. And the machine... it burns the retinas like an H-bomb blast! As much as I admire your aversion to extreme profit taking, the buyer knows exactly what they are in for and it would actually work. That is quite the novelty for an ebay machine. And why not make a profit? You put real work into this, your description is funny but not false, and if someone wins it for $500, then that is the fair price. Keep us informed, I want to watch it on eBy. Oh my! I'm not sure if I should let out a pleasant yelp of surprise, or be appalled and horrified! And I LOVE the idea of this! This so vulgar, so awful, so spectacuarly disgusting... I'm tempted to put a bid in; to be part of the typospherian satire of the decade. Robert, will you do pickup? This is just fantastic; if I hadn't been in the typosphere, I may just have fallen for that description! And I concur with Professor Polt; you should see how far the price gets out of control just for kicks! I'm with Richard. I think the experiment has to run its course by seeing what price the marketing will fetch. Also, what made me laugh first was "modish" of all things. 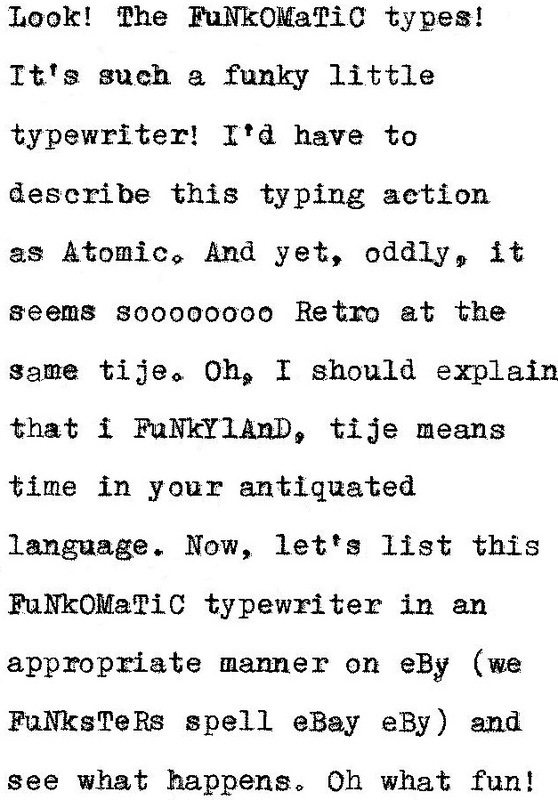 Great job on the Funky typewriter and the ad is wonderfully sarcastic -- the only thing mi$$ing are dollar $ign$ in$stead of S's! I like the basic design of the typewriter, as well as your paint job. Have you considered painting a Nakajima-ALL typewriter in an Art Deco style? In the US, eBay sellers misuse the phrase "Art Deco" as much, if not more than the word "Funky."